As promised, here's is my second entry in Johnsonville's No Ordinary Burger Contest, that I mentioned previously. This time out I use their chorizo patties to make a burger influenced by two classic Mexican dishes. I'm not a fan of eggs, but I am a fan of chorizo and eggs. The mildly spicy pork sausage brings a lot of much needed flavor to the party. The idea of a chorizo and eggs burger immediately popped into my mind when I contemplated contest recipes. After I had thought of the eggs, huevos rancheros came to mind. In the end I thought that combining the two basic concepts would probably be a killer burger, and it certainly is. The great thing about these is that you can serve them for breakfast, lunch, or dinner. Note: You want the onion rings intact and about 3" in diameter. Store the remaining onion for another use. Start your grill and prepare for direct cooking over medium heat (about 350°). While the grill is heating, tear off about 30" of foil aluminum and fold it in half. Once the grill is heated, put the foil on the grate, pour the oil on the foil and quickly spread it around with a wadded paper towel held by tongs. You want to completely oil the top of the foil so that the eggs don't stick. Tip: Use the new non-stick foil to ensure nothing sticks. Start grilling the chorizo patties on an open area of the grill, per the package directions. Add the onion rings to the foil and let them cook for about two minutes, just to soften them a bit. When the burgers have cooked about one third of the total time, gently crack an egg and pour it into one of the onion rings, then season the egg with 1/4 teaspoon of the pepper. Repeat with the remaining eggs. 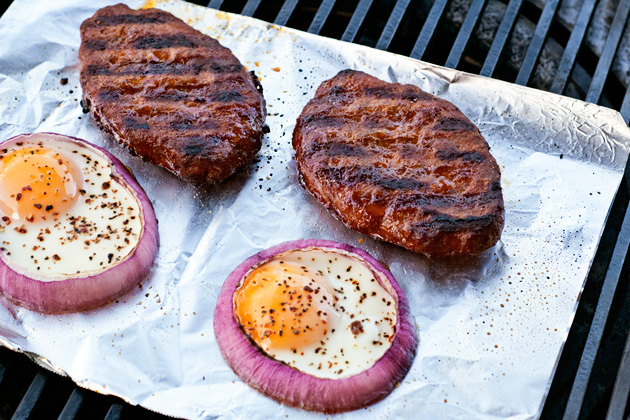 Close the grill lid and continue cooking until the burgers are just about done. During the last minute of cooking top each burger with a slice of cheese and let melt. Remove the burgers to a platter. 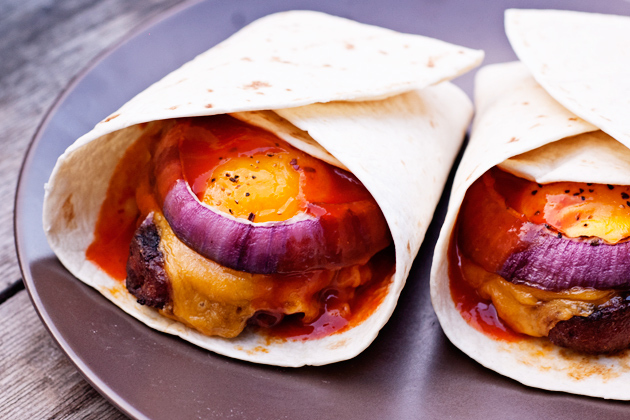 Place a burger on one side of a tortilla and add one of the eggs, with the onion. Drizzle the egg with 2 tablespoons of the enchilada sauce. 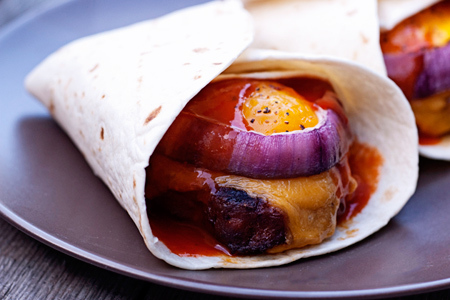 Fold the other half of the tortilla over the burger and egg, then fold the sides over the top to form a pouch around the burger. If you dig this recipe I'd greatly appreciate your vote for the contest. Thanks in advance. My first entry can be found here. Disclaimer: I was given product samples and a grilling kit as promotional consideration for the No Ordinary Burger Contest. I've long been a great fan of Johnsonville, and I'm happy to be working with them. Oh my gosh that looks amazing! I guess I'm missing something b/c I was thinking there's only 1 entry per person. We can do multiple? Thanks for your very nice comments, Steve. Regarding multiple entries, here's how the official rules read: "Limit one (1) entry per person/authorized e-mail account holder/Facebook account holder per calendar day during the Contest Period regardless of entry method." Oops...missed the "per calendar day" part... :). Thanks! Wow! This looks fantastic. This might convince me to have an egg on a burger!!!! Will be making this when I find the chorizo patties. Thanks for a great recipe. Mimi - Thanks for stopping by and commenting. You can search for the product on the right side of this page. Wonderful job, John! Creative, especially doing the egg that way, I'm impressed. This looks awesome! I definitely want to try making this sometime. I love the egg in the onion, that's clever and also would make serving it much easier. Thanks, Chad. I'm really glad that you enjoyed the recipe.